According to the Oxford English Dictionary chewing the fat was a phrase first used to refer to the grumbling and banter of junior army officers in the late 19th century. There has been much grumbling and controversy around how much and what type of dietary fat we should eat. In this blog I chew the fat about fat and try to make practical sense of the confusion. First a bit of chemistry revision. Before you glaze over or click out I will make it snappy. Fat is made up of molecules known as fatty acids. Molecules are units made up of different atoms joined together. The atoms in a fatty acid molecule consist of a long chain of carbon atoms joined to each other and to hydrogen atoms. At one end of the molecule is a “carboxylic acid” group (ie carbon, oxygen and hydrogen). At the other end of the molecule there is a methyl group (a carbon atom joined to 3 hydrogen atoms). Helps form the covering around our nerves that allows electrical messages to be sent around the body. Of course fat is better known as that unwelcome store of energy that accumulates when we eat too much. Fat contains more than twice as many calories gram for gram as carbohydrate or protein. This means that it can easily cause weight gain. When the products of fat metabolism accumulate in muscle they can block the signalling pathways needed for the hormone insulin to work. Insulin is needed to control levels of sugar in the blood. When the normal activity of insulin is blocked we call this insulin resistance. Insulin resistance can lead to obesity, heart disease, diabetes and high blood pressure. We also know that people with a lot of internal fat around the organs release lots of free fatty acids into the blood along with inflammatory hormones. These can further drive insulin resistance. Now it’s important that you also read my post on the “carbohydrate conundrum” because carbohydrate can also cause insulin resistance. This is why it’s so unhelpful to describe food groups such as carbohydrates or fats as either good or bad. It’s much more complicated and we need a balanced diet. There are four main types of fatty acid based on the number of double bonds between the carbon atoms and their position in the chain. 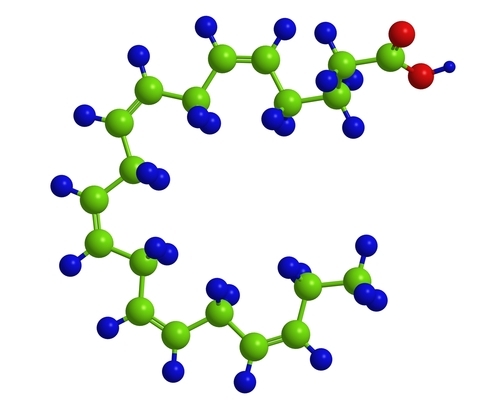 These double bonds are commonly referred to as being “unsaturated.” This simply means that the molecule is not saturated with as much hydrogen as it would be if the bonds between the carbon atoms were single. So what does all this chemistry mean for health. Well let’s take a look at the 4 types of fatty acid. These fatty acids have one unsaturated carbon bond in the molecule. Examples of foods that contain a lot of MUFAs include olive oil, rapeseed oil, avocado, seeds, nuts, particularly walnuts and nut butters. Think about using nut butters and mashed avocado as a replacement for butter and margarine when you really need it. These fatty acids have more than one unsaturated carbon bond in the molecule. Omega-3 and omega-6 fatty acids are two types of polyunsaturated fatty acid. The “omega” bit is just the way that chemists describe where the double bond is in the chain. Whilst we don’t fully understand why, where the double bond is does seem to matter in terms of the risks and benefits. Like MUFAs, PUFAs improve your cholesterol profile and reduce your risk of heart disease and stroke. However oils containing a lot of PUFAs eg corn, canola and sunflower are quite unstable when heated and so are not the best choice for cooking. Countries where people eat a lot of omega 3 fats have a lower risk of heart disease than we do in the UK. Also we know that omega 3 fats help reduce inflammation in the body. There is some evidence that omega 3 may help with memory and the prevention and treatment of depression. ALA or (alpha-linolenic acid) is a type of omega 3 fat found in vegetable oils, seeds such as chia seeds and linseed (flaxseed), nuts such as walnuts, pecans and hazelnuts and green leafy vegetables. It cannot be made in the body and must be obtained from the diet. There is less evidence that ALA is protective in relation to heart disease than there is for the omega 3 fats found in oily fish. These “fishy” omega 3’s are called EPA (eicosapentanoic acid ) and DHA (docosahexanoic acid.) Although our bodies can make EPA and DHA from ALA, the conversion rate is slow and only small amounts of EPA and DHA are made. It is therefore recommended that we include sources of EPA and DHA in other words oily fish, in the diet. In practical terms this means including salmon, fresh tuna, mackerel and sardines. Don’t be put off by scare stories about dangerous contaminants in oily fish. Just stick to the recommended amounts. Women who are pregnant or breastfeeding, or likely to become pregnant, and girls who may become pregnant in the future, can safely have up to two portions of oily fish a week. Women past childbearing age or not intending to have children, men and boys can eat up to four portions of oily fish a week. Omega-6 mostly comes as linoleic acid in plant oils such as corn oil, soybean oil, and sunflower oil, as well as from nuts and seeds. Linoleic acid is an essential fatty acid meaning that it cannot be made by the body and so must come from the diet. Along with omega 3 fats the omega 6 fats have been shown to reduce our risk of heart disease and stroke. Research has shown that most of us easily get enough omega 6 fats in our diets already. It has been suggested that the ratio of omega 6: omega 3 fatty acids is important for health. The exact ratio is now thought to be less important. Instead there is more of an emphasis on replacing saturated fats with unsaturated fats, particularly omega 3 fats, which we eat very little of in the UK. These fatty acids have no unsaturated carbon bonds in the molecule. Animal fats from meat and dairy products tend to be high in saturated fat. A few plant foods are also high in saturated fats, such as coconut, coconut oil, palm oil, and palm kernel oil. Despite recent controversy, science still indicates that we should have a diet that is low in saturated fats. Don’t simply replace them with refined carbohydrates like sugar, white bread and white rice and pasta. Eating refined carbohydrates in place of saturated fat lowers the “good” HDL cholesterol and increases triglycerides, which increases the risk of heart disease and stroke. Furthermore we know that different SFAs have different effects on the body. For example myristic acid found in butterfat and palmitic acid found in palm oil increase the risk of heart disease and stroke. However stearic acid found in dairy, beef, dark chocolate and olive oil is not thought to increase the risk of these diseases. 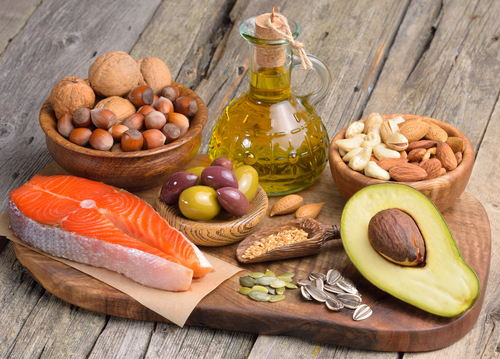 The Scientific Advisory Committee on Nutrition is currently reviewing all the high quality research evidence about dietary fat and is due to report next year. This might give us more information about which saturated fats we can safely include in the diet. Until then keep your intake low but replace saturated fat with unsaturated fat and make sure you have plenty of foods high in omega 3. These fatty acids are a type of unsaturated fat. In many unsaturated fats the hydrogen atoms attached to the double-bonded carbon atoms are on the same side as each other. In trans fatty acids the hydrogen atoms attached to the double-bonded carbon atoms are on opposite sides. Trans fatty acids are formed when fatty acids are partially hydrogenated. Hydrogenation just means that the fatty acid is combined chemically with hydrogen. Have harmful health effects even in small amounts. Unsaturated fats in plants eaten by ruminant animals undergo a natural hydrogenation process in the rumen of the animal. This is why milk and some animal products contain very small amounts of trans fatty acids. In contrast, industrial trans fats are formed when liquid vegetable oil is converted into a solid through the chemical process of hydrogenation. Trans fats are also produced when vegetable oils are heated to fry foods at very high temperatures. Foods containing trans fats from artificial hydrogenation contain large amounts of trans fats. Foods containing naturally produced trans fats contain very little. Biscuits, pies, cakes and deep fried foods are sometimes high in trans fatty acids, However health concerns about these fats led to many manufacturers reducing the amounts of trans fats in foods. To find out if a food contains trans fats you will need to check ingredients lists. If a food product contains partially hydrogenated fats or oils, it will almost certainly contain trans fats too. The higher up the ingredient list the more trans fats the product is likely to contain. That said research shows that our intake of trans fats is now well below the safe limit and this is largely because of the changes in food manufacturing. Have a diet low in total fats and saturated fat. Include some fats and ensure that they are unsaturated but cook with oils high in MUFAs not PUFAs. Take care to ensure that we are not regularly eating foods that still contain trans fats. In the next few years we may get more information about the health benefits of some foods containing saturated fats but the jury is still out. It’s important to be aware that foods contain a mixture of fatty acids in different ratios. Some foods that are high in MUFAs also contain a lot of SFAs eg oily fish and nuts. This reflects one of the key challenges of nutrition which is that we eat food and meals that are a mixture of nutrients. Hence it’s a nonsense to talk about single nutrients and food groups in isolation especially when labelling them as simply good or bad. Have more of a “plant-based” diet. You don’t need to become vegetarian or vegan just start thinking about basing your meals around vegetables, fruit and wholegrains. Consider designating one or two days a week as meat free days. When you do have meat choose lean cuts and remove any visible fat. Think about adding beans, peas or lentils to meat dishes. All this will help cut back on total fat and saturated fat. Include dairy products. There is some evidence to suggest that the saturated fat in dairy is not detrimental to health but the jury is still out. If you are overweight lots of milky coffee and full fat yogurt is not going to help you slim down. Make sure you are sticking with unsweetened dairy products. Where possible use low fat cooking methods such as grilling, dry-frying, baking without adding oil or steaming. Use olive oil or rapeseed oil for cooking but remember the calories are the same whether it’s rapeseed oil, olive oil or lard. 1tbsp oil in a dish to serve 4 is a good guide for the right amount to use. Rapeseed oil and olive oil are high in MUFAs and lower in PUFAs than other common vegetable oils like sunflower, corn and canola. These high MUFA oils are much more stable when heated and so they are a safer choice. Only include biscuits, chocolate, cakes, crisps, pretzels and other processed snack foods as treats on rare occasions. They are high in saturated fats and may contain a lot of trans fats. Have fruit or low fat unsweetened yogurt for dessert and keep pies, cheesecakes, sponge puddings, ice-cream, trifles and other less healthy desserts for treat days. Use nut butters and mashed avocado instead of butter in sandwiches. Remember that although these foods will boost your omega 3 intake they will still bump up your calorie intake, so don’t go mad. With moist fillings like tuna and salmon you should find that you don’t need butter or a substitute anyway. Check labels and look for foods with less than 3g total fat/100g and less than 1.5g saturates/100g. This entry was posted in Balanced diet, Fat and tagged fat, omega 3, saturated fat, unsaturated fat by Stephanie.fade. Bookmark the permalink.